DMO is proud to announce the launch of a direct-write laser lithography machine: MicroWriter ML. 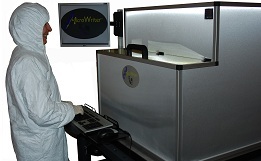 MicroWriter ML is a direct-write photolithography machine for rapid prototyping in R&D laboratories and small clean rooms. Conventional approaches to photolithography are usually based on exposing through a chromium-glass mask manufactured by specialist vendors. In R&D environments it is often necessary to change the mask design frequently. Direct-write laser lithography overcomes this problem by holding the mask in software. Rather than projecting light through a physical mask, direct-write laser lithography rasters the sample beneath a number of computer-controlled lasers, each pulsing on and off in order draw the pattern to be exposed directly onto the photoresist. MicroWriter MLTM is a new design of direct-write laser lithography machine which combines the flexibility of maskless direct writing with high speed and low cost.